It's been a bit of a wondrously happy week for us here at Vinspire. We've given away the third of our summer giveaway prizes, we've sipped some beautiful wines in the sunshine and we've surpassed 1000 fans on our Facebook page! So I decided this was ample reason to whip up a celebratory dessert or frozen cocktail creation. 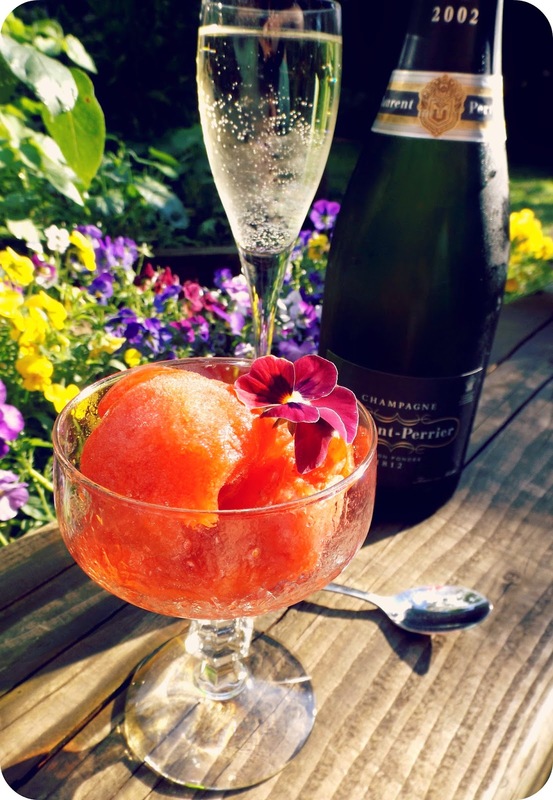 The strawberries are SO good at this time of year that I had to include some of them, and I had some delicious (also in season) elderflower cordial to use up, and I think there's really only one perfect boozy accompaniment to these guys: CHAMPAGNE! It is a celebration, after all. 3. Once the champagne syrup is totally cool, stir it together with the strawberry mixture (you'll need to work at it for a minute or so until the two mixtures blend properly.) Pour it into a shall tray or tupperware container and pop it in the freezer. 4. Take it out to give it a stir every so often (I did it every 40 minutes or so) for around 6-8 hours or until it's nice and scoopable. Serve with a glass of champagne - either in a separate glass or poured over the top for an extra refreshing after dinner treat. Et voila! A boozy, fruity sorbet that's incredibly moreish. I particularly love this because you get the flavours in waves - first strawberry, then elderflower, then champagne. Here's to more brilliant weeks - I hope yours was just as good!